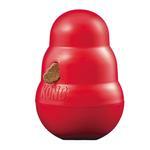 The KONG Wobbler is a treat dispenser and toy all in one. Dogs can try pawing it, nudging it or batting it around. The Wobbler will not fall down. A fun and entertaining way to stimulate pet play, the Wobbler randomly dispenses food or treats as pets push, pull and rock it back and forth. For best results use KONG SNACKS (sold separately) or kibble. Easy to fill with treats with the twist-off bottom. Made of hard rubber, this is not a chew toy. 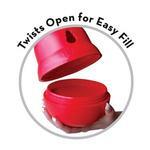 Simply twist off the top, fill dish inside with dry food or treats, screw the top back on, then give to pet. The Wobbler can also be used as an alternative to a dog bowl to help slow and extend mealtime while providing exercise for your dog. KONG Wobbler measures approx 7.5" tall x 5.1" wide. Opening for dispensing treats measures 1". 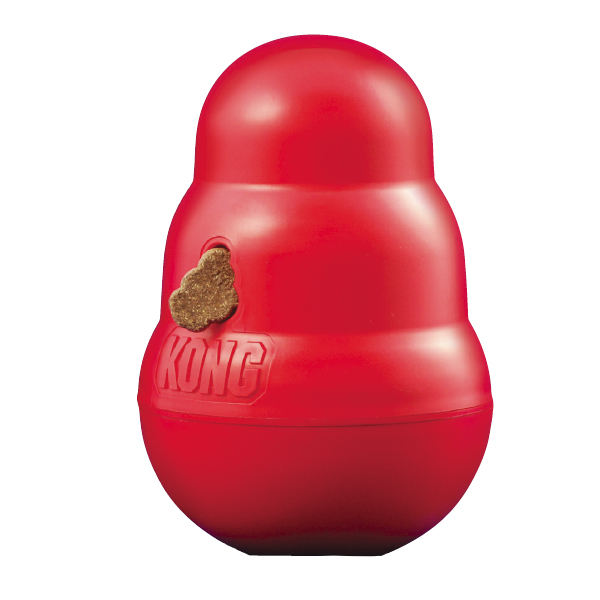 This large KONG Wobbler holds approximately 1 cup of kibble. KONG Wobbler Dog Toy Customer Photos - Send us your photo! Faeden is an 8 month old golden retriever and he loves his baxterboo toys! I am ordering him a buckeyes jersey soon for football season! :) Pics to come! Great Treat Toy My Dog Loves! Posted On 10/02/15 by Katie from Fredericksburg, VA Yes, Katie recommends this product! My dog loves this toy! I have a 30 lb. Spaniel who adores the small wobbler, which really isn't all that small. I give him 3 meals a day so I can put his lunch kibble in the wobbler and he bats it with his paws all over the kitchen and gets his food by working for it. He has the best time and a little bit of a work out plus mental stimulation! It is very durable and he has used it for years. I just unscrew the bottom, turn the toy upside down and put the food in the top, then screw the bottom on and turn it upright again. It is very strong and durable plastic. My 68 lb. Aussie enjoys the large and not one of the wobblers has been damaged in all the daily use for years. That being said I always supervise my dogs with the kong wobbler in case it gets caught under a chair or jammed under the floor cabinets. I have had to help my dog get it out from under stuff. Please be supervising when using it. Cleans very easily. Large hole size gets bigger with toy size. Food driven Dogs LOVE It!!! Posted On 03/11/15 by Alex from , CA Yes, Alex recommends this product! 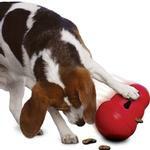 Our dogs eat all their meals from food-dispensing toys and this is one of our favorites. Easy to fill and fun to use. You can't change the difficulty but it seems easy/challenging enough to keep them occupied and they love it!! I feed my dog every single meal out of her Kong wobbler. It helps her meals last longer and prevent her from wolfing it down too fast. It also provides her with a little brain game each times she eats. She loves it, and I do, too! Checkout involved too many steps. My billing address is in Puerto Rico, and I kept getting an "incomplete information" message. I had to figure out that I had to type something into the "State" field even though Puerto Rico does not have any states.